Inevitable in every theater season is the sleeper play, the one you overlook: the curiously titled unknown quantity you don’t quite connect with as a lure from the hearth on a cold Thursday night. 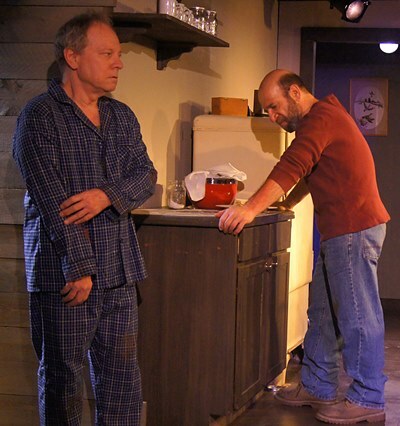 Such an unforeseeable beauty and memorable winner, a genuine sleeper, is Michael Healey’s “The Drawer Boy” at Redtwist Theatre. First, a word about the title. With World War II heating up, two young pals from the Canadian outback, Morgan and Angus, decide it sounds like a great adventure and enlist. Actually, it’s Morgan’s idea. He’s a farmer. He has to talk college-bound Angus into joining the foreign fun. Angus has a poetic temperament and an artist’s flair with a pencil. As the two men look back on those days from a gaping distance, Angus becomes the drawer boy. It’s 1972, which makes the two lads now fiftyish, though Angus looks maybe 10 years older than Morgan. They own a modest Ontario farm together, and they share a tragic past. But only Morgan knows the full depth of that abyss. “The Drawer Boy” is a painful, radiant tale of loss and guilt and moral honesty. 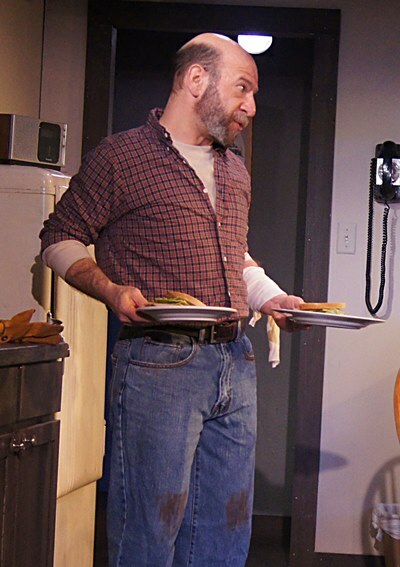 And every inflection of Canadian playwright Healey’s sensitively crafted drama resonates with compassionate truth in the performances of Brian Parry as the once-gifted boy who could draw and Adam Bitterman as the farmer who now looks after his friend and reassures him with the story – no, a story – about that distant time when two adventurers went off to war. The short of it is that Angus suffered a severe head injury during a London air raid, and from that day has been unable to remember much of anything – neither events long past nor the name or purpose of a young man he met five minutes ago. Still, Parry’s ever-flummoxed Angus is a sweet-tempered, amenable fellow who knows how to make a good sandwich. His equable disposition is shared by Morgan, who just rolls with Angus’ forgetfulness and finds things for him to do around the farm. There’s never a shortage of good sandwiches. 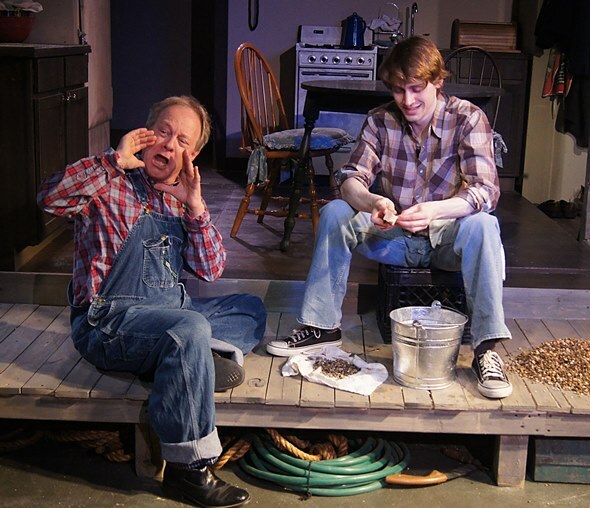 We are led to their farm, and into the darker recesses of their history, by Miles (Aaron Kirby), a theater student from Toronto who’s collecting impressions of farm life to work into a play he’s co-writing with other students. Miles talks Morgan into letting him help out around the place to really get a feel for farm life. There’s a can of worms buried here, and Miles proves to be the can opener. The story of Morgan and Angus, anyway the version of it Morgan repeats, concerns two pretty English girls the boys met in London, and how Angus got hurt in the air-raid and they all eventually came back to this farm. Angus designed a double house for the two couples, the story goes, but then something terrible happened to the girls. The story ends peacefully, however, and Angus loves to hear it told and retold. This terrific tale, which Kirby’s amused acting student tells with earnest fervor, stirs something in Angus. He joins in some story-telling himself, and by bits and flashes, memories come back. He becomes increasingly aware of his totality, his history – and a present time that is out of joint. Miles, well-meaning if impetuous, urges Angus on, and in a careening sequence forces Morgan to recast the old fable in its grim reality. Morgan also has suffered all these years, albeit in silence, and Bitterman brings a muted high intensity to the man’s torment and to his love. 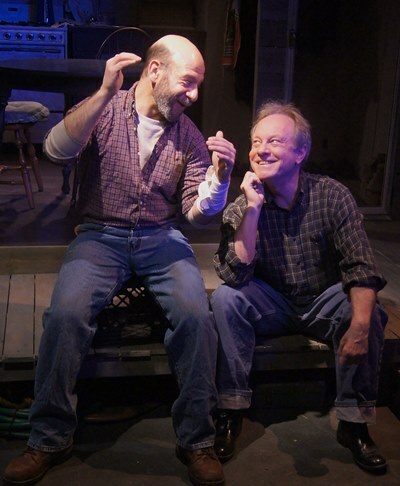 The invisible hand of director Scott Weinstein is everywhere in this fluid, richly textured and engaging production. Set designer Eric Luchen’s unfussy farm kitchen is a manly place – a comfortable, restful place, one where you’d expect to get a good sandwich.